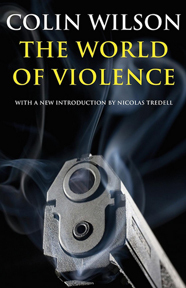 Several extremely rich men have died under suspicious circumstances, and Karl Zweig, a professor of philosophy, has reason to suspect they were murdered by his former student, Gustav Neumann, a brilliant young man who had once espoused the desire to become a master criminal. When he observes Neumann in the company of Sir Timothy Ferguson, a wealthy and sick old baronet, Zweig believes he may soon be Neumann's next victim. But as Zweig races to gather evidence against his old friend, he begins to be unsure whether any murders have been committed at all. Instead, Neumann may be involved in something even more disturbing and bizarre than anyone could ever imagine . . .
First published in 1964, Necessary Doubt is a suspenseful and page-turning thriller that reflects Colin Wilson's lifelong interest in crime and murder and explores intriguing questions of existential philosophy. This edition is the first in more than thirty-five years and features a new introduction by Colin Stanley. 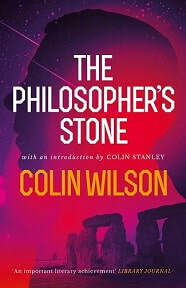 Colin Wilson was born in Leicester in 1931. 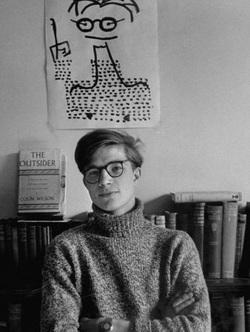 He left school at 16 and worked at various jobs while reading and writing in his spare time. His study The Outsider was published by Victor Gollancz in 1956 and became an overnight sensation in England and America, bringing widespread popular and critical attention to its 24 year old author; the book has never been out of print. He followed The Outsider with two further nonfiction works, Religion and the Rebel (1957) and The Age of Defeat (1959), which were not as well received, before turning to fiction in 1960 with Ritual in the Dark, a novel he had worked on since age 17. He continued to write prolifically in numerous genres, both fiction and nonfiction, including works on the occult, crime, and serial killers. 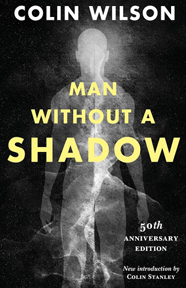 His prolific output of fiction includes two subsequent novels featuring Gerard Sorme, the protagonist of Ritual in the Dark--Man Without a Shadow (1963) and The God of the Labyrinth (1970)—as well as novels in the vein of H. P. Lovecraft, including The Mind Parasites (1967) and The Philosopher's Stone (1969). 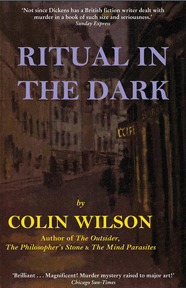 Wilson published more than 150 books over a long career and lived for many years in Cornwall. He died in December 2013.